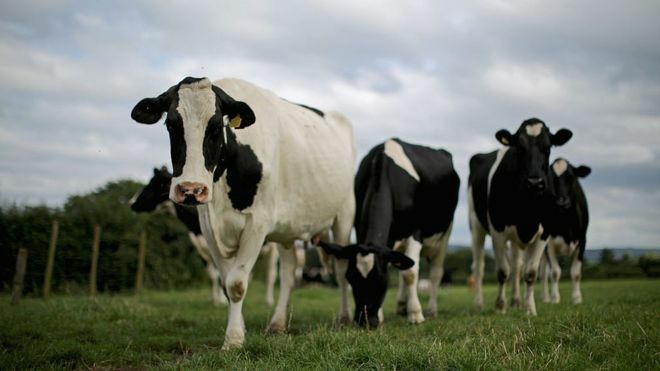 The UK could be facing a butter and cream shortage this Christmas, the boss of dairy giant Arla has warned. "The first sign we will see of it, is that the price of butter rises very sharply," Peder Tuborgh, chief executive of the farmer-owned firm told the BBC. There was insufficient milk being supplied by farmers to make the products, he said. The National Farmers' Union dubbed his comments "scaremongering". Arla Foods is a large European milk co-operative, owned by dairy farmers including British ones, and is the largest UK milk buyer. Its brands include Anchor and Cravendale, and it has annual revenues of 9.6bn euros (£8.4bn). Mr Tuborgh said the milk shortage had come about because producers "put the brakes on" in 2016, in the wake of previous overproduction of milk and consequently lower prices. He said consumers would feel the impact across Europe in the coming months, suggesting that price rises would differ between European nations. However, the Arla boss did not want to predict how much butter would cost later this year. "At the moment, we are trying to get as much butter and cream out of our producers," he said. It comes as global butter prices have hit an all-time high, according to figures released on Thursday by the UN Food and Agriculture Organization.